As part of our PRIDE activities scheduled throughout the year (PRIDE represents our core values, based on the acronym Passionate about Packaging, Respect, Integrity, Delivering Beyond Expectations and Enjoying it), staff members of Keenpac immersed Birmingham City Centre on 9th September to launch a ‘treasure hunt’ styled event, involving key retail stores in the Bull Ring, Grand Central and Square shopping centres. The stores visited were invited to take part in a packaging questionnaire – all in the name of market research! Following the event, we entered all stores into a prize draw, from which we selected a winning store. The winner was [cue drum roll….] Build-A-Bear Workshop based in the Bull Ring (www.buildabear.co.uk). 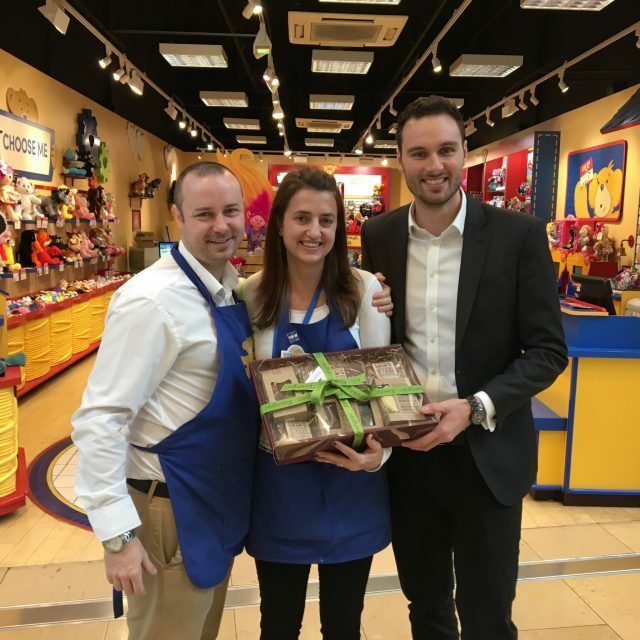 Store Supervisor, Maria Doggett, was delighted to receive a fantastic hamper personally delivered by Keenpac’s Kyle Nash Build-A- Bear’s account manager. A very big thank you to all the stores that participated in our questionnaire – we really appreciate your time!